It was my please to give the 20th annual WIDER Lecture at the Stockholm School of Economics in 2016. 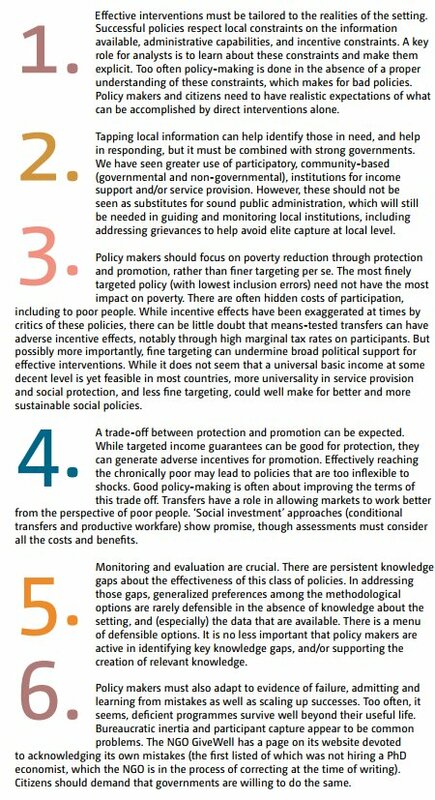 An extended version is now available, Interventions Against Poverty in Poor Places. The aim here is not to provide a complete survey of the policies in practice; while many specific policies are discussed, they serve the role of illustrating more general points rather representing an exhaustive listing of policies. The emphasis is on establishing some guiding principles relevant to developing countries. The WIDER Lecture distinguishes two goals for these policies, namely protection and promotion (applying a distinction made by Jean Drèze and Amartya Sen in their book Hunger and Public Action). The former is about helping people deal with uninsured risks—avoiding transient poverty—while the promotion role is about permanently escaping poverty. Protection policies aim to provide short-term palliatives to help assure that current consumptions do not fall below some crucial level, even when some people are trapped in poverty. Promotion policies aim to either: (i) allow poor people to break out of a poverty trap, by permitting a sufficiently large wealth gain to put them on a path to reach their (higher and stable) steady state level of wealth; or (ii) raise productivity for those not trapped—to raise their steady state level of wealth. The WIDER Lecture begins with a broad overview of the coverage of both types of policies across the world. The Lecture then turns to the economic debates about these interventions, after which the discussion goes more deeply into the main instruments found in practice, and what we know about their effectiveness. The Lecture discusses both cash transfers and market-oriented policies.